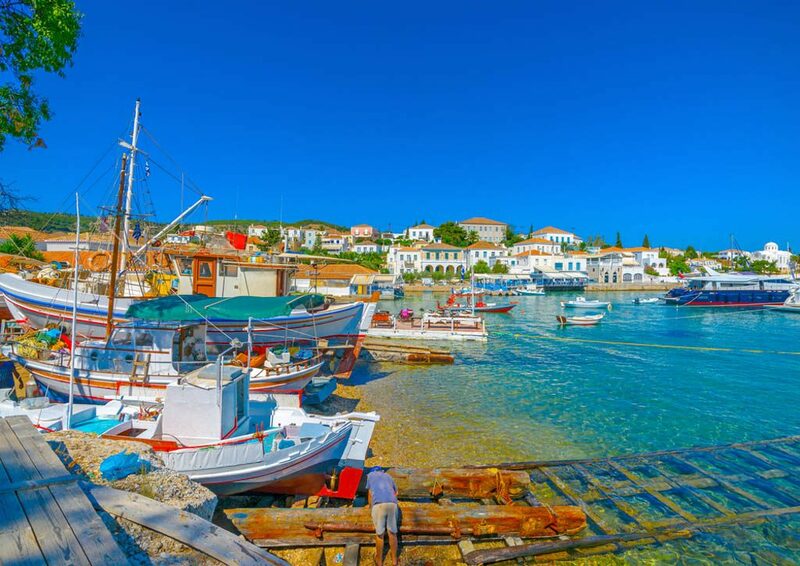 An island with a prominent past, Spetses is known for its long naval tradition and has been a popular holiday retreat for the affluent Athenians. 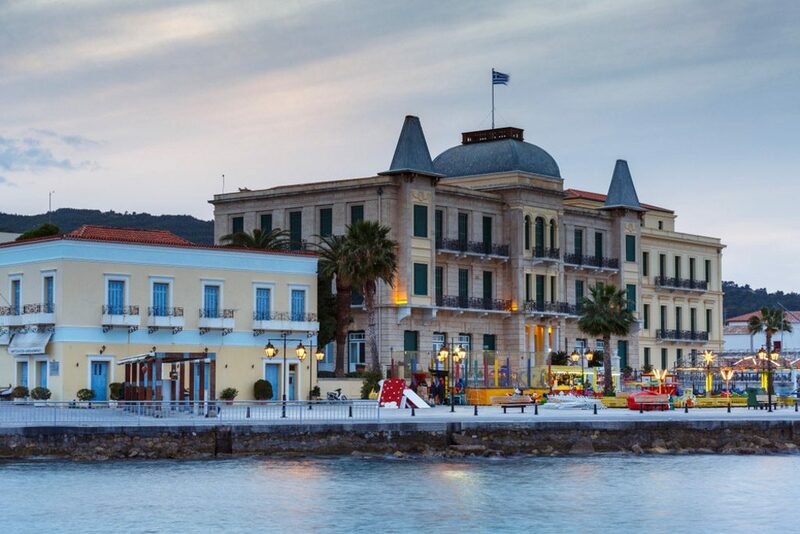 Spetses or Isola di Spezzie, the island of aromas — a name given by the Italians during the Venetian belongs to the Islands regional unit of Attica and on numerous occasions has been included as one of the Saronic Islands. A short two hour boat ride from the port of Piraeus, Spetses belongs to the yet to be discovered destinations in Greece, making it a perfect weekend getaway when you are visiting Athens (Also check out my 4 days in Athens itinerary). 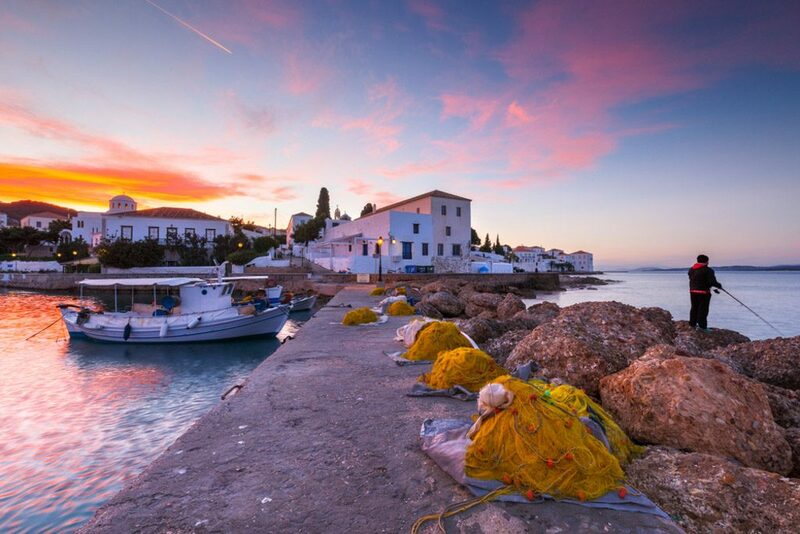 Read on to discover the top things to do in Spetses. 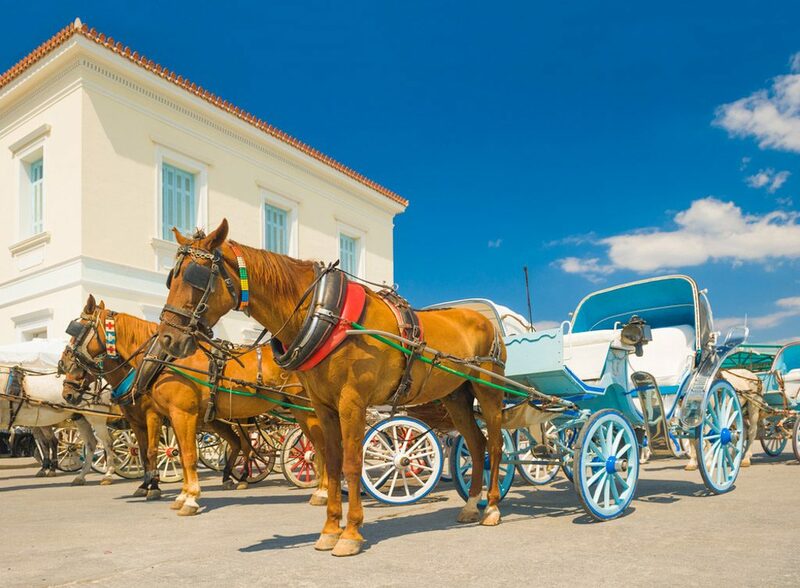 Here, it’s all about aristocratic charm, Neoclassical buildings, pretty cafes, chic boutiques and riding in horse carriages, since cars are forbidden on Spetses. 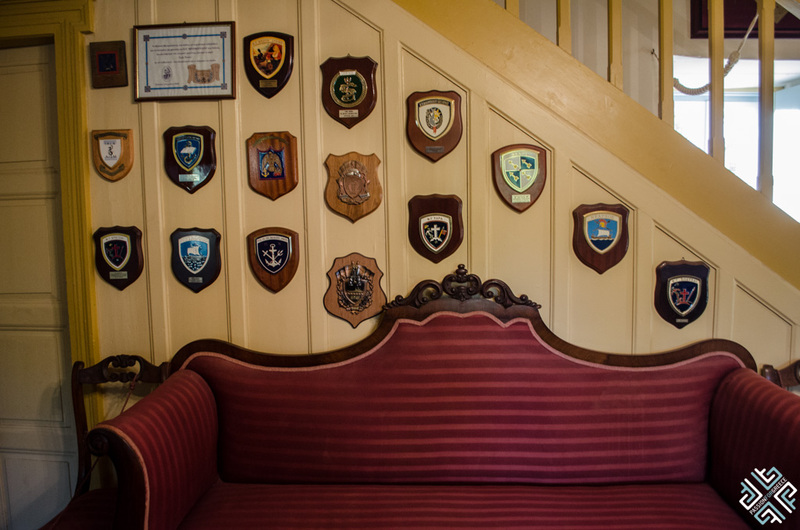 The harbour has maintained its timeless charm, where you will find numerous grand captain mansions which remind of the glorious past. 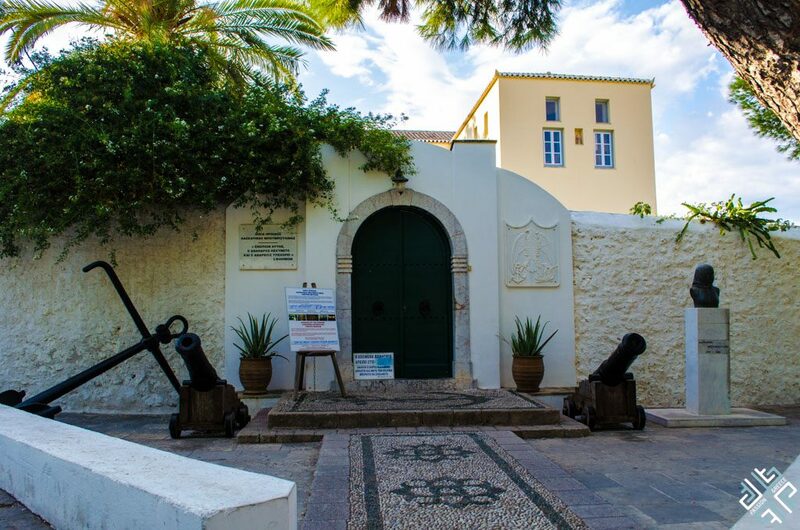 Spetses played a crucial role in the 1821 War of Independence. 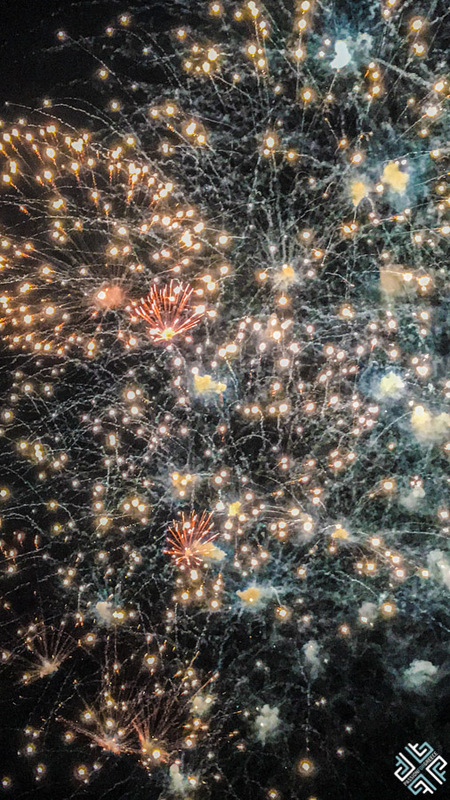 Visiting Spetses in September for the Armata celebration is highly recommended — a remarkable experience that will bring you closer to the island’s rich historical past. You will often hear the name Laskarina Bouboulina on the island. This warrior heroine is remembered as a Greek National hero who was involved in the Greek War of Independence. She was the first to raise the Greek flag, twelve days before the war started. This strong willed woman was equally involved in planning the strategy during the course of the war. 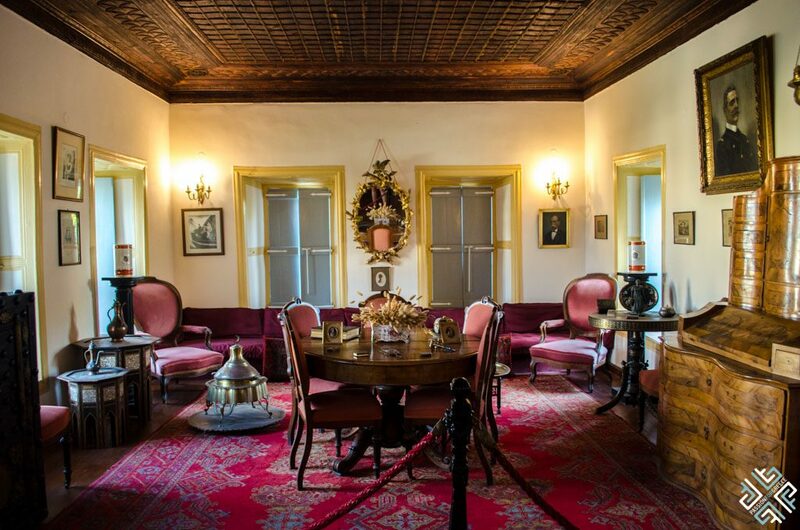 You can visit her house which now runs as a museum and displays a collection of her personal belongings. The museum is run by Bouboulina’s relatives. 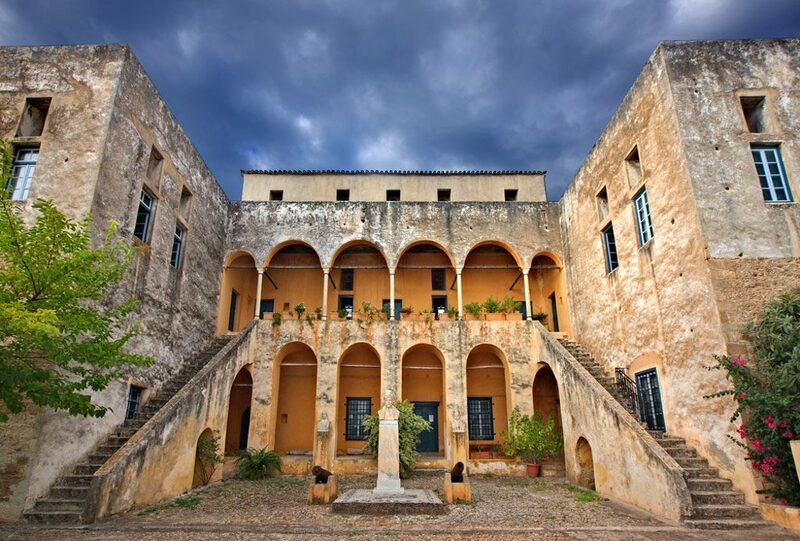 One of the wealthy citizens of Spetses, Hatzigiannis Mexis also played a crucial role in the Greek revolution. His house has been turned into a museum that houses a display of letters written by the warm heroes, folk art collection as well as relics belonging to Bouboulina. Here you can admire objects that portray the island’s history which is over 4,000 years old. 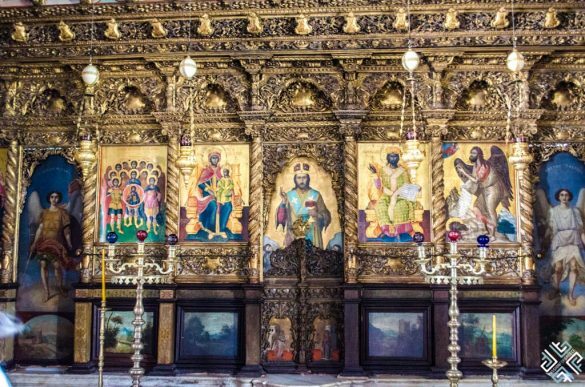 One of the most prominent cathedrals on the island of Spetses is the actual location where the Independence flag was raised on 3rd April 1821. 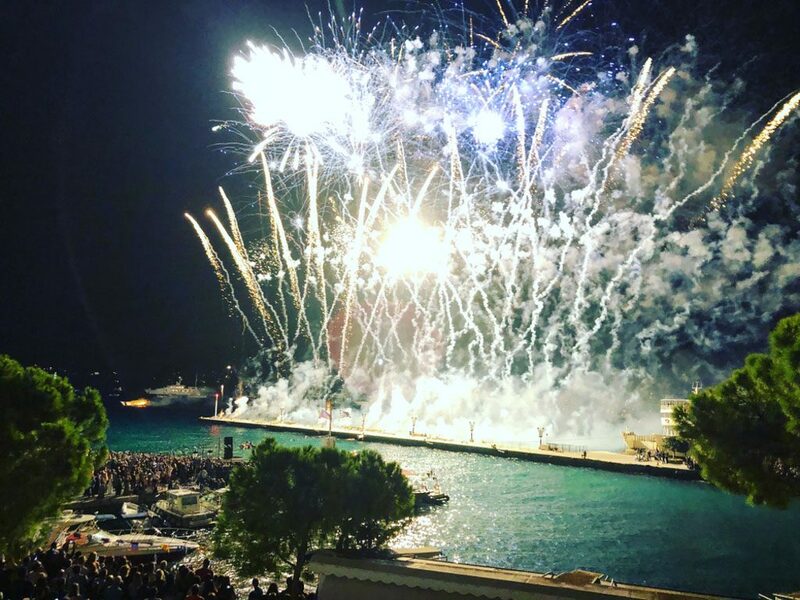 One of the most important celebrations on Spetses is the Armata, the re-enactment of a naval battle that has been taking place every September since 1931. 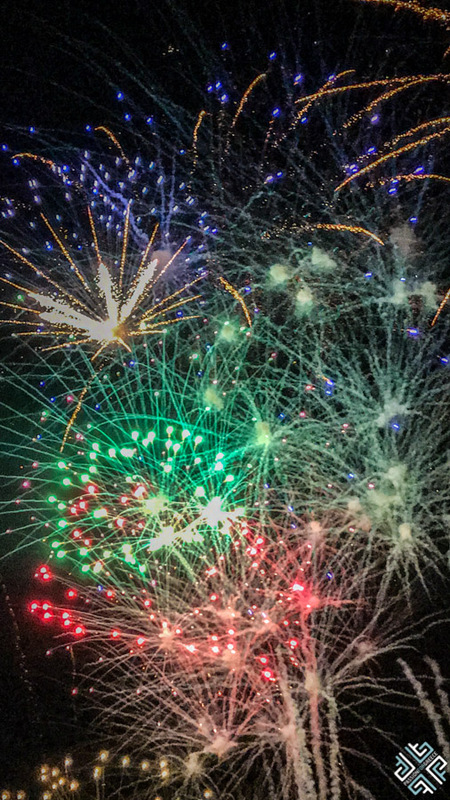 The island’s harbor fills with locals and visitors who gather here to admire the impressive show that incorporates the island’s fleet and music, followed by a spectacular fireworks display. 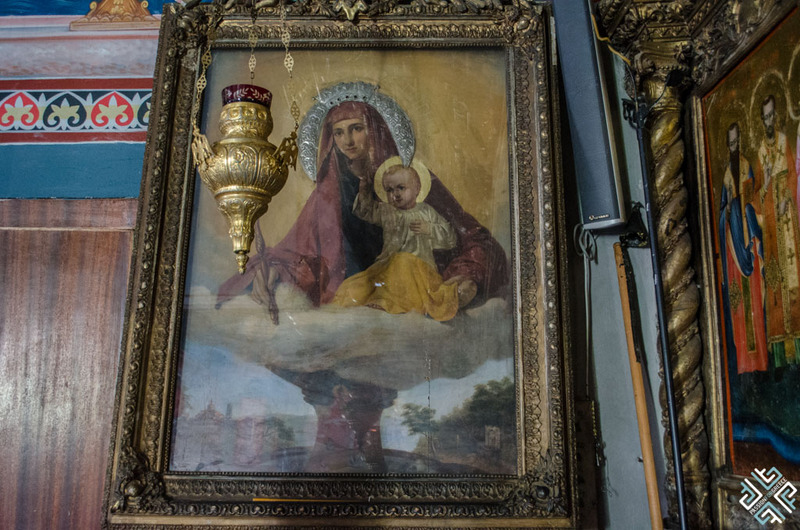 Located in the old post of Spetses this rural church dedicated to Virgin Mary of the Armata was built between 1824-1830 in honour of the victory against the Ottoman invasion in 1822. Stroll around the charming promenade and admire the gorgeous architecture of this small, chic island which has been referred to as the Greek Monaco. You will come across the numerous cannons which are still here, looking out into the sea — serving as a reminiscence of its complex past. In the heart of the old Port of Spetses you will come across the traditional shipyards where Spetsiots continue the tradition of their ancestors by keeping the craftsmanship of building beautiful wooden vessels alive. 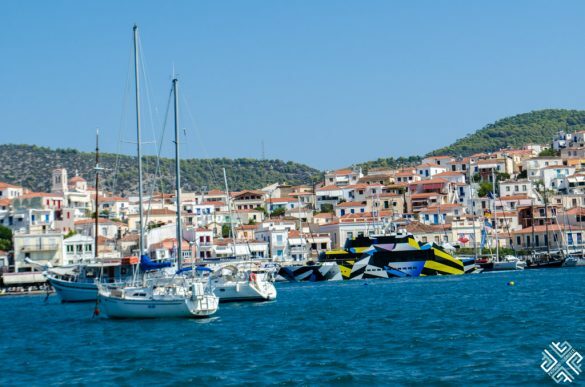 Since earlier times Spetses was one of the largest shipbuilding centres of Greece, and is one of the very few places which continues this tradition to this day. 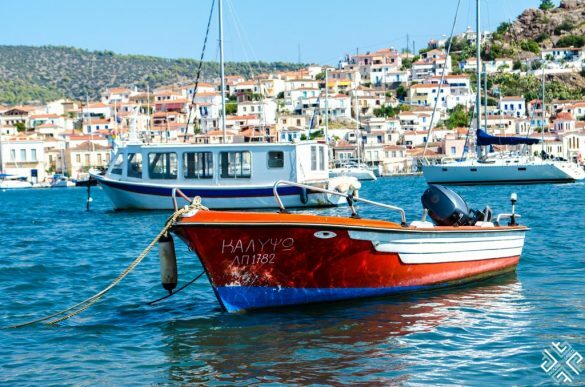 You might also enjoy reading about the traditional shipyards in Skala Kallonis Lesvos and Patmos. 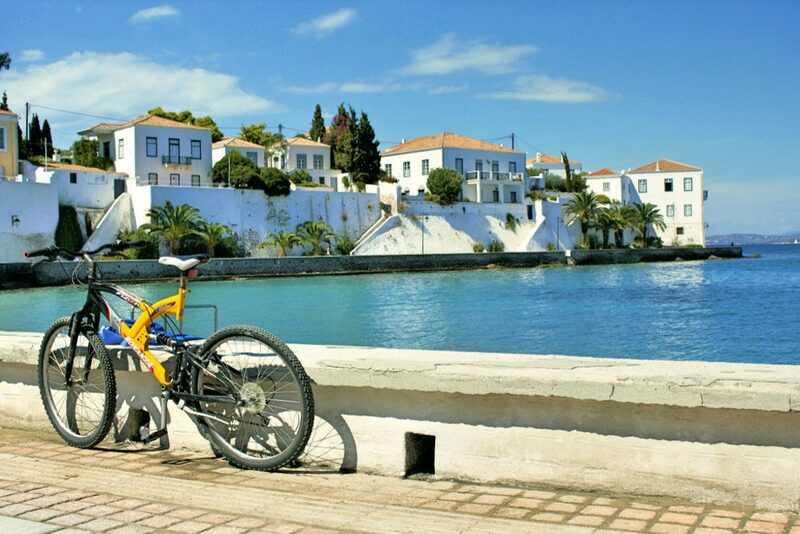 Spetses is a bike-friendly destination where you can easily explore the islands highlights on two wheels. Cycle by coastal road lined with lush pine-trees. In fact one of the ancient names given to Spetses, was Pitioussa translating as pine-filled. Every spring a weekend event called Tweed Run is organised by Poseidonion Gran Hotel where participants dress in tweet and cycle around Spetses. What a better way to soak in the romantic vibe of the island than to take a horse-carriage ride and enjoy the splendour of a horse-drawn island excursion. 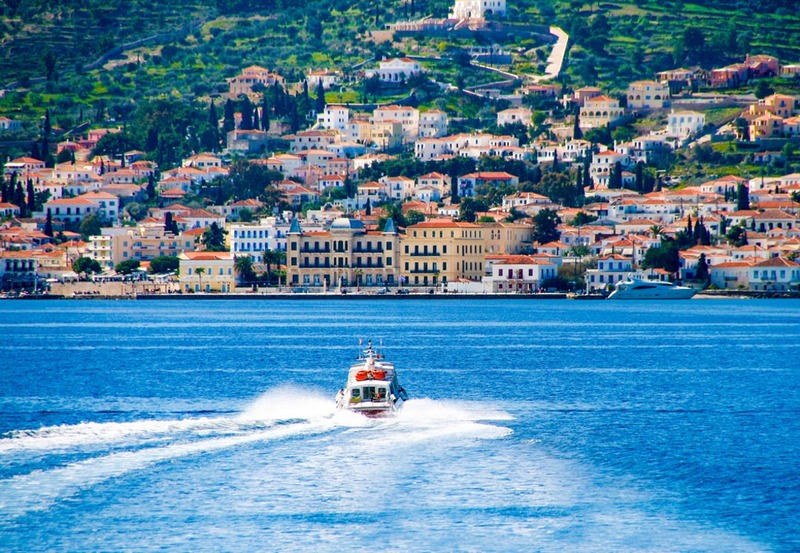 This is one of the most romantic things to do in Spetses. The beaches of Spetses are scattered across the island, some are at a close proximity to the main port Dapia and others can be reached by a boat. The most famous beach of the island is Agia Marina which is located 2 kilometres south east of Dapia. It is an organised sandy beach with bars and restaurants as well as water sports facilities. 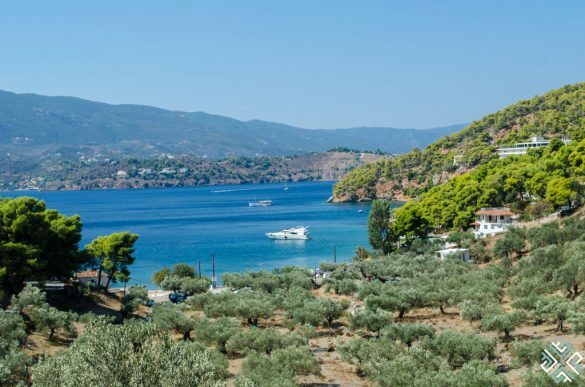 The beach of Agia Paraskevi is located 12 kilometres west of the island, it is a beautiful sandy beach shaded by pine trees. Water sports facilities are available on this beach. If you are looking for a more secluded option, the beach of Xylokeriza can be accessed by a boat. One of the best Spetses beaches is Agion Anargiron which is 10 kilometres southwest from the centre is located in a gorgeous, green bay. Here you will find a few restaurants, cafes and water sports facilities. At a close proximity to the beach is the sea cave of Bekiris which was used as a hiding escape for the women and children during the Ottoman invasion. The beach can be accessed by a bus which runs from May to September, or with a boat on an organised day trip. 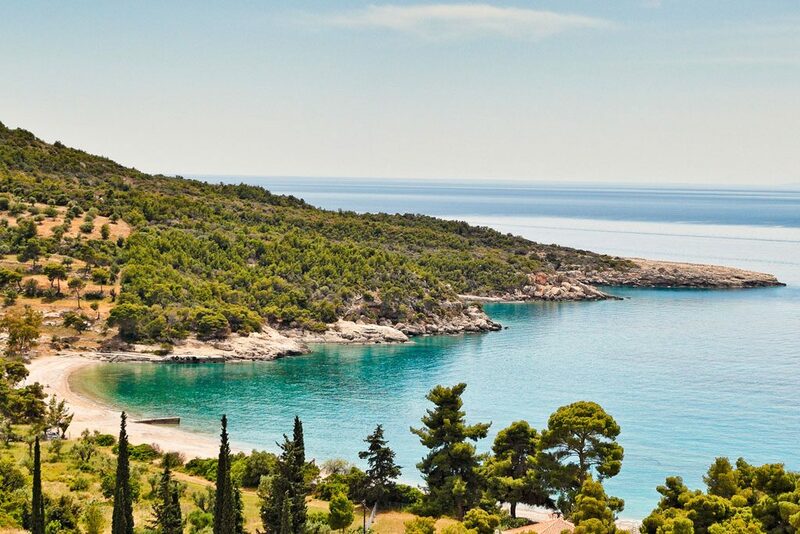 For a pristine setting head to Zogeria, which is a sandy beach with beautiful clear blue waters shaded by pine trees. There are several traditional tavernas in the area. You can visit this beach with a boat. The small island of Poros is part of the Saronic Gulf, and is separated from the Peloponnese by a narrow sea channel. 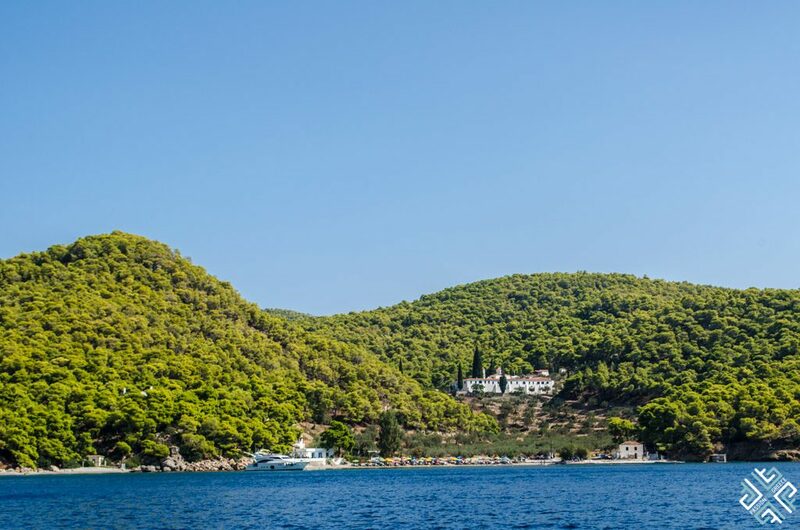 Situated an hour and twenty minute ferry ride from Spetses, it is a wonderful opportunity to combine your weekend escape and visit a few islands at once. Alternatively you can rent a small boat and visit all these places at your own leisure. 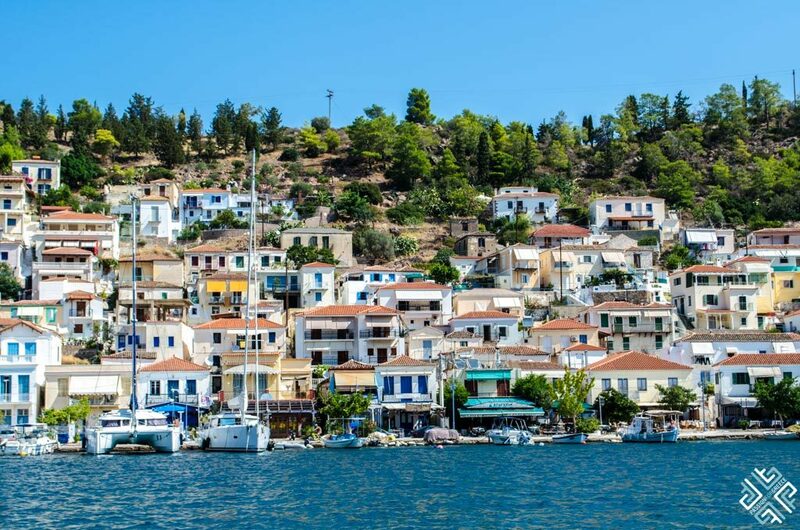 You can also briefly visit Poros on a one day Greek Island Cruise from Athens. During our weekend trip to Spetses, we spent a few hours exploring Poros with a private boat excursion. 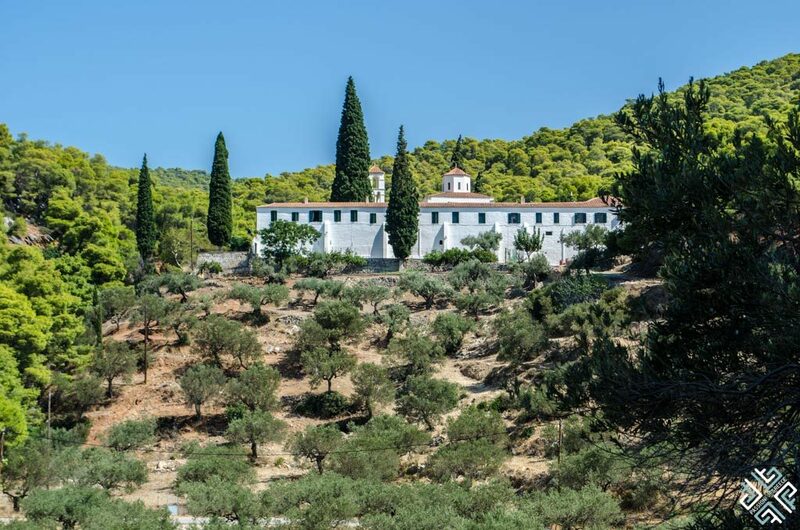 We visited the historical Holy Monastery of Zoodochos Pigi of Poros which is located 4km east from the centre of Poros. Perched on a hill of a pine forest. The monastery was founded in 1720 by the Archbishop of Athens, Iakovos the 2nd who was suffering from lithiasis and after having drank the water from the spring located nearby, he was miraculously cured. The monastery also played a crucial role during the Greek War of Independence where the first Governor of the liberated Greece Ioannis Kapodistrias, got strength by praying in this monastery. Along the coast we passed the Russian Dockyard where Russia had maintained a Naval squadron in the Aegean since 1770. This part of the island was used as a naval and trading center. This spot has become a popular yachting destination, there is also a pier for small boats. You can extend your trip by spending more time discovering this small, relaxing island. There are several daily departures of flying dolphins to Spetses from the port of Piraeus. The duration of the trip is approximately 2 hours with the flying dolphins and 2,5 hours with the flying cats. For tickets and availability click here. 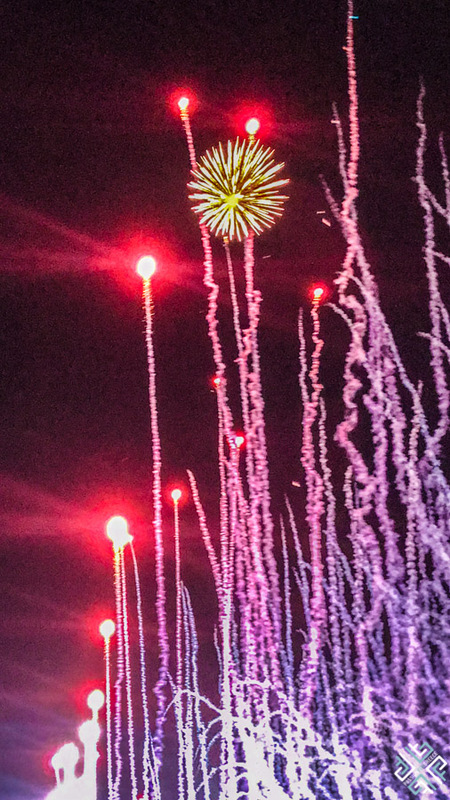 By car: You can drive to Kosta by car from Athens. 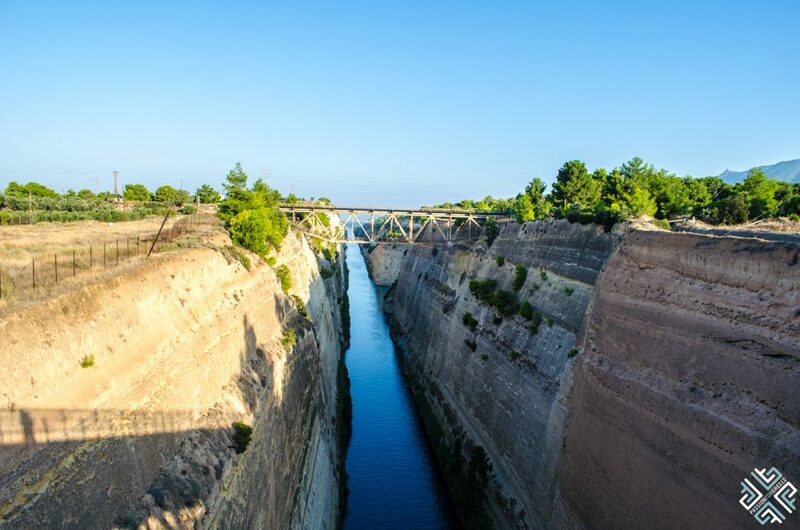 Take the Attiki Odos and then the National Road Athens – Corinth, after the isthmus, head left in the direction towards Epidaurus. 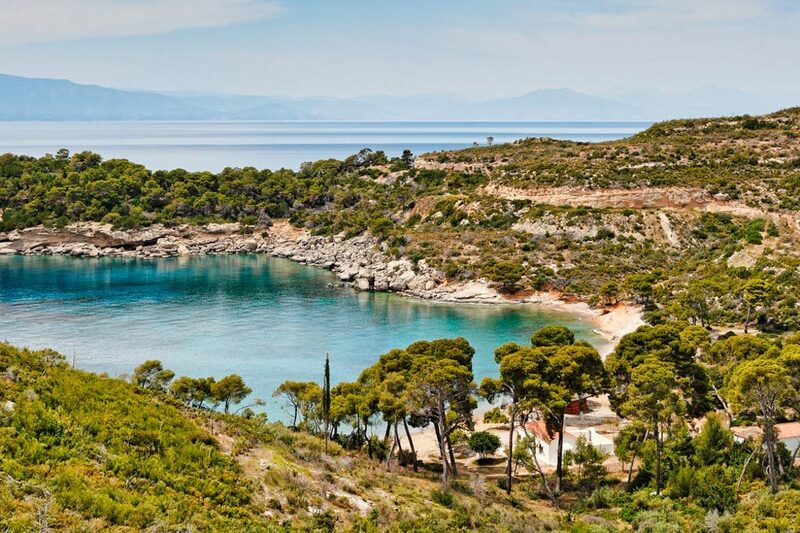 After approximately a 30 minute drive you will come to an intersection where you will see signs for Poros and Spetses. 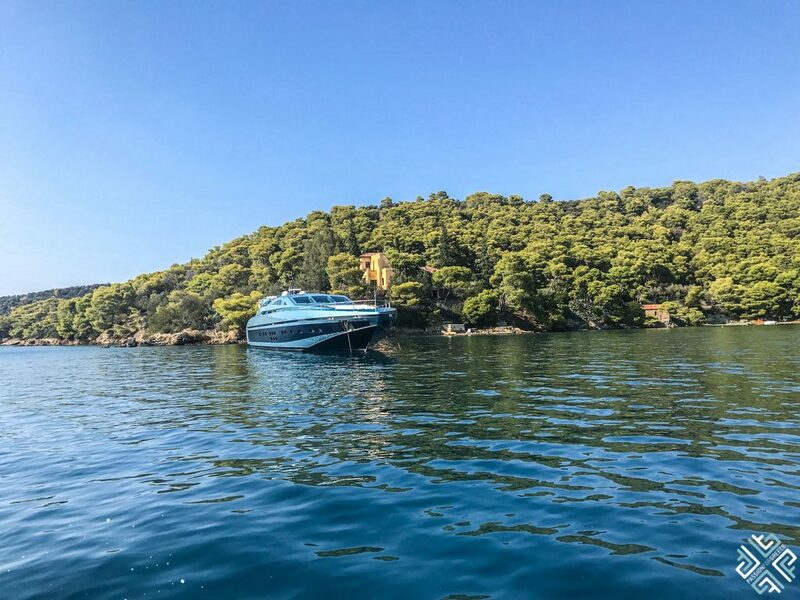 Following the direction towards Kranidi, after about an hour you will reach Porto Heli (another popular resort), from where you will shortly reach Kosta. By a traditional boat which is only available during the summer months. With water taxis that run between Kosta and Spetses, 24 hours. 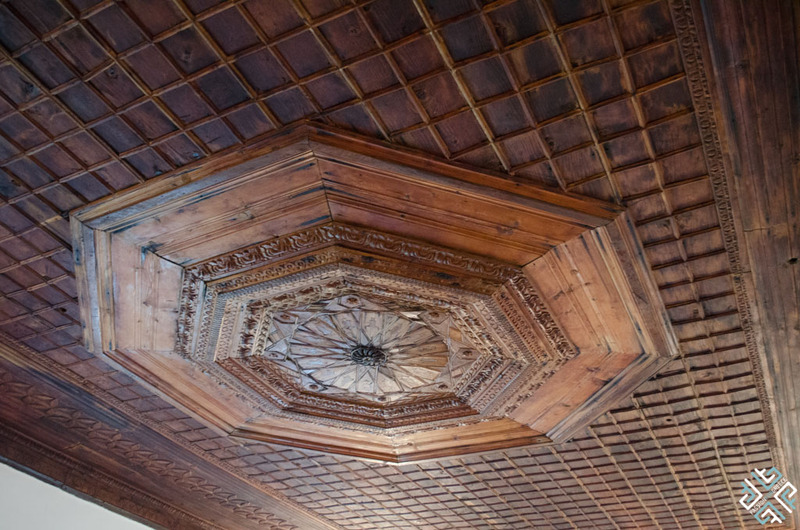 This 5-star hotel is housed in a historical building built in 1914. This landmark hotel is located right in the heart of the harbour overlooking the Aegean City. Accommodation ranges from Deluxe Rooms, to Family Suites and Royal Suite, among other luxurious room categories. For availability and rates click here. A boutique 4-star hotel located in the old harbour of Spetses. Accommodation ranges from standard rooms, to maisonettes ideal for families, and the old mansion which spans across two floors occupying 200 square meters of space. For availability and best rates click here. A 4 stars hotel located a short 10 minutes walk from the centre of the island, Dapia. 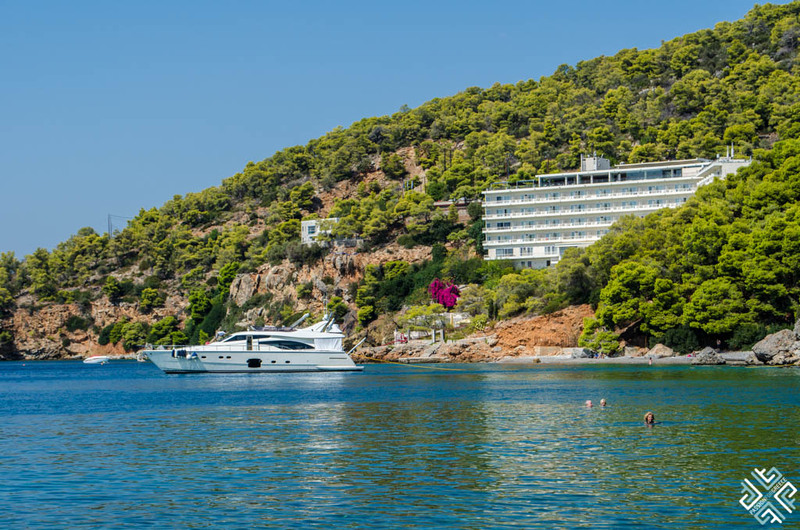 Accommodation includes seafront rooms, family rooms and villas. For availability and rates click here.